Real Madrid star Cristiano Ronaldo just learned he has a baby boy. Ronaldo plans to raise the child on his own, and the mother’s identity will remain a secret. Just days after his native Portugal was eliminated from the 2010 World Cup, Cristiano Ronaldo has learned that he is the father of a baby boy. It is with great joy and emotion that I inform I have recently become father to a baby boy. As agreed with the baby’s mother, who prefers to have her identity kept confidential, my son will be under my exclusive guardianship. No further information will be provided on this subject and I request everyone to fully respect my right to privacy (and that of the child) at least on issues as personal as these are. Cristiano, 25, who has never been married, has never been in a relationship that has lasted longer than a few months. Ronaldo, who has a well-earned reputation as a womanizing ladies man, has previously been linked to American socialites Paris Hilton and Kim Kardashian, British actress Gemma Atkinson, aspiring Spanish model Neireida Gallardo, Italian tv presenter Letizia Filippi and Italian model Raffaella Fico, to name a few. Ronaldo, who was devastated by Portugal’s World Cup loss, said he was disconsolate after the defeat. “I feel like a broken man, completely devastated, frustrated and with an unimaginable sadness,” he said. Perhaps having a son will help put his sadness in perspective. 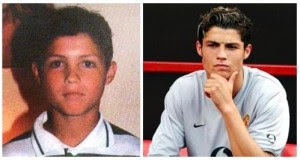 Maybe his son will be as cute as Cris was as a child?